Five percent. The dimensions of the of the A 440 mezzo violin plates are scaled just 5% larger than the 14" violin grand pattern that has been in use since the 1720's. My mezzo violin has good projection over the full range from the open G then all the way to up. And, it was made in a Chinese workshop. Top luthiers are able to make instruments with strong projection over all strings using the standard 14" patterns. It takes significant skill for them to achieve really great instruments. But when lesser makers and production shops using the same patterns, many things fall apart. At the bottom of the barrell, there is the VSO. May 20, four years ago, FedEx delivered my mezzo from Bob Spear, one of his imported instruments. Each year, I have written a blog for V.com about it. For me, returning to the violin after 50 years, it is the perfect instrument. One that rings well and is easy to play and it projects all of which make it a joy to play, but still, in playing, I need to do everything right. The price is in line with the beginning of serious student instruments at about $1200. (Currently Bob's prefered imported instrument is the master shop level at less than $1800. More hours are invested, in Ithaca, finishing and improving graduation and set up of these instruments.) Should you be in the market, add one of these to your list to consider. Also handmade mezzos can be ordered From Spear in Ithaca and Joris Wolters in Belgium. Where did the A 440 mezzo come from? It was the last instrument developed by the CatGut Accoustical Society. 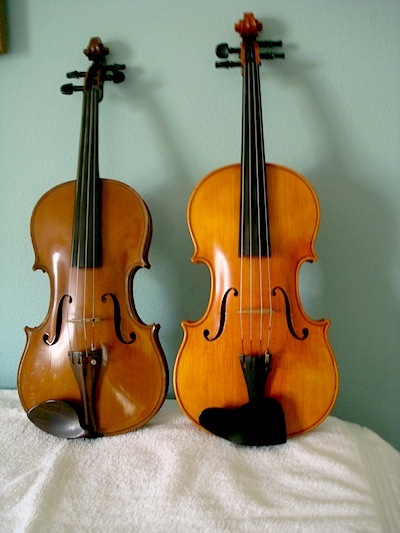 In the 1960's, the CAS scaled up and down a set of eight violins based on the violin. It was required for the set of these instuments to cover the full range of the piano wit h some overlap. It was also required that all notes played on each instrument project well. The scalings of these instruments were based on acoustical paramenters, not dimensional measurements. At the beginning of research, the violin was thought to be the perfect instrument and there was no plan to change it. But when the first octet was complete and played as an ensemble, the violin was overpowered by each of the octet instruments. Therefore back to the calculations, based on their experience gained on the other seven instruments the A 440 mezzo was designed. For more, find the Singing Woods Violin website. The first set worked, but Carleen Hutchins and the physicists were not satisfied therefore went back to work and revised all instruments into a Generation II. In this century, Bob Spear with the help of physicists has developed Gen III and IV instruments with improvement at each generation. These instruments are not the brainchild of an individual claming to have found the secrets of Stradivarius but dedicated acoustic scentists and luthers. I am now adding "A 440" to mezzo as there is another group who make a set of strings for the violin but to be tuned an octive lower. They also call it a mezzo. Therefore a 14" instrument is the A 220 mezzo. You can find the strings on the internet. If you are looking an A 220 instrument look at the tenor violin from the octet. It will fill the hall with sound and many overtones lost by amplifiers. If Stradivarius had lived for another 25 years, I believe that he would have developed the A 440 mezzo. Unfortunately, he died prematurely at 93. Would you play a 5% larger violin in order to gain the benefits of the A 440 mezzo? I've had one of the original Hutchins Mezzos in my hands and heard it played up close. Very nice instrument. However, I think the idea of "better" or "improved" is misguided. It is interesting to note that Hutchins came to this out of a problem of loudness, not a problem of tone. Or so she thought. Another person might have "fixed" the problem by lowering the power of the other instruments such as the tenor, the small bass, and the treble. The tenor (the octave violin) is especially a problem for the standard violin, because it "fills" the violin register with its own upper partials, right in lock step. Similarly but on the other end, the treble is, well, a treble screamer, again, being one octave above the violin, right in lock step tonally. I like to see the mezzo more for its variation, not for its superiority. It has its own tonal flavor (as does every individual fiddle) and its own idiosyncrasies. There is a paradox in the violin world. From the outside, all fiddles are the same, and there is an expected violin "sound." To an insider, there is much much more variation than that, and every fiddle you pick up has its own personality. Compare this to the guitar world, where there are different types of guitars. Would anyone really want to make the assertion that a 1926 Gibson L5 is inferior to a Martin D-18? Of course not--they are different tools. The world is richer for having both of them on the stage. I like to see the mezzo in this frame of mind. Taking this one step farther, consider the Octet as a whole and you realize that the differences between the cello, the enigmatic viola, and the violin, are in fact a benefit to the composer: they have their own tonal flavors and this enables separation when needed, and blending when needed, too. The Octet is more "harmonious" but that also means there is less range in color. Why do we love string quartets? What is it about that? Well, it is that sweet spot between blending and differentiating. The flow in and out of those modes. The character of the sound of each instrument being different is part of that. Take it a bit further, to the bluegrass ensemble, with fiddle, mandolin, and D-18, bass, and dobro, and you see my point: the throaty but treble mandolin, working with and against the bass but bright D-18 is a sonic delight. Bluegrass with 4 guitars is just not as interesting even if they play different parts! I'm not against the octet, mind you. It is very interesting! But I think it has yet to be explored to its full potential and in the meantime, I agree with your thinking, that the Mezzo is a worthy route to consider, for your fiddle needs. Will it gain wide acceptance? No. Why? Because the fiddle is dominated by the "classical" and not by contemporary music. Tradition pulls hard. Perhaps it is not surprising then, that the Mezzo I mentioned touching, is played in a bluegrass environment. Could you please provide us with the dimensions of the Mezzo? Ribs are much shallower, body is longer and bouts proportionately wider. That's in line with the one I've seen up close. It feels like a "les paul" after you have been playing an ES-175. So, the same dimensions as a 15" viola, except dramatically shallower ribs? I used to think that there were not enough pitches of violin, having often turned up at rehearsal with viola when I should have brought violin and vice-versa now I think that there are too many. Thank you for your intrest Seraphim. Since there are four generations of the A 440 mezzo, there are four sets of dimensions. I do not have the gen I dimensions at hand other than it did have a body length of 406mm. For the Gen II body: 385mm, lower: 237mm, center: 125mm, upper: 184mm, rib: 18mm. For the Gen III body: 380.5mm, lower: 177.5, center: 112.5mm, upper: 230mm, rib 25mm. For the Gen IV body: 376mm, lower: 217mm, center: 117mm, upper: 180mm, rib 29mm. Therefore with comments describing the mezzo all being contridictory (like the blind men describing an elephant) they are all correct when applied to the proper generation of the mezzo. It is nice to see you posting about them so that perhaps a wider audience will become aware of them. BTW did you know that Yo-yo recorded on the vertical viola on one album? The history of the Octet is not well understood, so it sometimes leads to erroneous conclusions. The original request came from composer Henry Brant, and the development of a scaled octet was intended to fill in the gaps left by the disappearance of earlier instruments that had existed in the string family. Power was not the point. That came about concurrently as Hutchins learned more about how a violin works and incorporated her findings into the New Family. I must point out that all of her findings can be applied beneficially to the old family as well. There is also a tendency to regard the octet instruments as a cookie-cutter exercise in which all the instruments sound exactly the same. Yet we all know that there are hundreds of thousands, if not millions, of standard violins out there, and we all know that none of them sound the same. The same is true for the New Family-- none of them sound exactly the same, either. A variation in size of stringed instruments was greatly prized by earlier generations for the diversity of tone color it provided. Look at the small (Amati-- Cremonese school) violins and the large (Maggini-- Brescian school) violins of earliest violin history; look at the paired large and small violas that added wonderful fullness to the middle registers; look at the many other examples to be found in cellos (called "basses" back then). I like to think that the opportunity for greater tonal color in the string instruments is back. Or have we become so tonally dehydrated that we are terrified to take a drink from the old, pure spring?